Basically, a grease is comprised of three parts: the base oil, additives and a thickener. The base oil may constitute between 70 to 95 percent of the grease. It provides the grease’s viscosity and film thickness, and is the foundation upon which the grease is built. A mineral, synthetic or vegetable-based oil may be used in a grease. The oil type is selected based on the desired properties needed for the application. Additives are employed to impart new properties or to suppress or enhance existing properties of the base oil. They can make up between 0 to 10 percent of the grease and typically offer protection to rotating equipment during startup and shutdown. Additives can also help protect against rust and corrosion. The thickener is critical, as it is the vessel that delivers the base oil and additives to the equipment. It can represent between 3 to 30 percent of the grease. There are many types of thickeners, but most fit into two categories: simple soap or complex soap. Other thickeners, such as polyurea, clay and silica, do not fall into these categories but also act as thickening agents in specialty grease formulations. 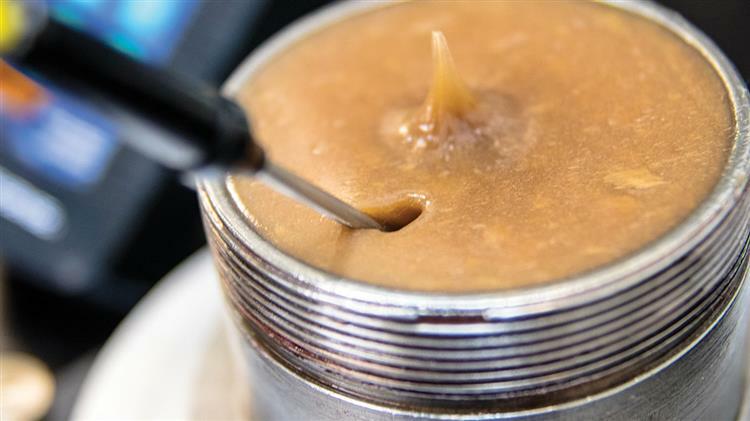 Now that you have a better understanding of how grease is formulated, let’s look at four tests that can reveal how the grease’s ingredients will interact inside a lubrication system. The first property to consider is the base oil’s apparent viscosity. Viscosity is the most important property of any lubricant. To determine the required base oil viscosity, you must identify the optimal viscosity for each system component you plan to lubricate. A grease’s base oil viscosity is noted on its product data sheet. Once you have established the required viscosity, test the grease to find its apparent viscosity. This relates to mobility of a grease moving through lines and components of a centralized lubrication system. Apparent viscosity involves the collective influence of the base oil, additives and thickener. The ASTM D1092 standard test is ideal for measuring the apparent viscosity of lubricating greases. It can help predict pressure drops in a centralized lubrication system under a steady flow and at a constant temperature. The results of this test are reported in centipoise. You also will need to determine the required consistency or NLGI grade of the grease. A general starting point is the expected operating temperature and speed factor. Other variables that can impact the required consistency include the bearing type, thickener type, base oil viscosity and base oil type. A cone penetration test (ASTM D217) is frequently employed to gauge a grease’s consistency. It utilizes a weighted cone to penetrate a block of grease, with four standards of testing the grease’s consistency: undisturbed, worked, prolonged worked and block. The focus of this article will be on the undisturbed and worked tests. An undisturbed penetration test provides information on the grease’s consistency during storage conditions. Worked penetration tests reveal what the consistency of the grease will be while inside a machine or component. This is imperative with centralized grease systems, as the grease may be in “storage conditions” for a prolonged period before it reaches the component. Storage conditions apply to grease both while it is in a drum or other storage container and in supply lines. Among the factors to keep in mind when planning a supply-line path are the temperature exposures, vertical paths, and the time it takes for the grease to enter the supply line and reach its destination. These factors can cause the base oil and thickener to separate, leading to oil starvation in the equipment. Next, assess how stable the grease will be as it is subjected to operating conditions. You must know if the grease will be able to handle the intended loads and for how long before it begins to fail. The ASTM D1831 structural stability test method utilizes a penetrometer test of unworked grease. The same grease is then worked in a standard roll stability device for two hours at a temperature between 20 to 35 degrees C (68 to 95 degrees F). The grease is then put through the penetrometer test again. The difference between the two tests is used to measure the effect of low shear stability of the oil in the grease. The final test relates specifically to matching the grease to the lubrication system’s design and the size of tubing to be utilized. Depending on how far the grease will be pumped, the tubing size can significantly impact the system’s cost. A ventability test will identify the supply-line diameter required for a specific grease. It can also assist in determining whether the grease can be used in a centralized lubrication system and whether grease valves and injectors will function properly. The test pressurizes grease to 1,800 psi in a 25-foot coil. After the grease has stabilized at 1,800 psi, a relief valve is opened and the pressure gauge is read after 30 seconds. Matching this pressure reading to a supply-line reference chart will provide the diameter needed. Also, when choosing a supply line, be sure to select an appropriate material. Some metals, such as copper and galvanized steel, can have severe effects on the grease’s composition. It should also be noted that when grease is subjected to certain conditions under pressure, it can undergo what is called cake-lock. This occurs when the grease thickener’s movement is restricted, leading to a block in the line or component. The base oil may still flow, but the thickener will not. Without the thickener, the base oil may not reach the working zones of the components, thus creating lubricant starvation. All three parts of a grease (the base oil, additives and thickener) can contribute to cake-lock, and no single element can increase or decrease the possibility of the condition. With the results of these tests, you should now have the necessary information to make an informed decision. Consider your budget for a centralized system when making your grease selection but design the system around the grease. Avoid common mistakes such as having a supply-line diameter that is too small or too large, using too much or too little pressure to push grease through the supply lines, and sacrificing essential grease properties just so the lubricant can flow through the system. Now, if you are asked which comes first when designing a centralized lubrication system, the system or the grease, you’ll know the right answer.